HÀ NỘI — Liquidity of the Vietnamese đồng in the banking system has shown signs of cooling down over the past week. This has helped the central bank withdraw money from the banking system, a new report from the Saigon Securities Company (SSI) revealed. 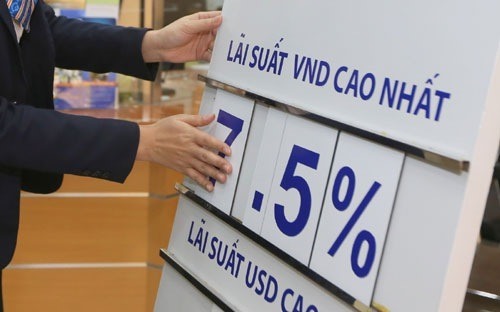 In its weekly report on the monetary market, SSI said the central bank last week withdrew VNĐ8 trillion (US$352.4 million) from the banking system following four consecutive weeks of having to consecutively pump in a significant amount of money to support liquidity. However, interest rate in the inter-bank market last week still stood at a high level. The overnight rate closed the week at 4.55 per cent per year, inching down by only 0.83 percentage points against the end of the previous week. After rising in mid March, deposit rates listed at commercial banks last week remained unchanged, of which the rate for six-month deposits averaged 6 per cent per year and for 12-month deposits averaged 7 per cent, SSI reported. SSI forecast that interest rate could be kept stable and could even be reduced in the coming months if credit growth and capital mobilisation were balanced. The central bank is capable of managing this, SSI said. Lending from January to March 23 rose by 3.14 per cent against the end of last year while capital mobilisation rose 3.07 per cent, the central bank reported.